Shoreline Area News: Bumblebee Code! When I processed this photo of a bumblebee (found her in my neighbor’s tree) first thing I noticed were her feet — had to see what the internet had to say! 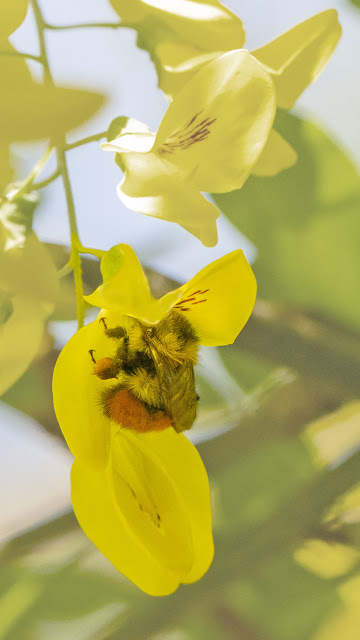 Turns out her feet are in the news: last Spring Dr. Richard Pearce (University of Bristol) and his colleagues published their research in “Scientific Reports” explaining that bumblebees’ smelly feet constitute a code that, among other things, helps lead others to lunch. The scientists' experiments showed that the bees leave a scent wherever their feet touch a surface, and that other bees can distinguish their own nest mates from stranger bees, and their own scent from their sister bees’ scents.